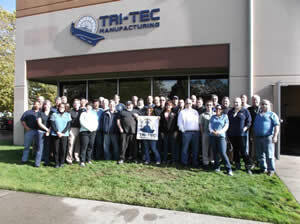 Tri-Tec Manufacturing began as a family owned company in Kent, Washington in 1972 and has been serving the US Navy and other customers ever since. We are passionate about serving and listening to our customers to provide the most advanced, reliable products on the market today. For example, we developed the first actuation device to comply with specification DOD-v-24657 in 1985 and have over seven thousand actuators currently in use. The Company was purchased by three employees in 2006, moved to its current modern location in 2009 and continues the great tradition upon which the Company was founded. Product lines have expanded, the quality program is certified to ISO 9001/2015 and machine shop and engineering capabilities have grown to keep pace with technology. Tri-Tec is a leader in engineering, designing and manufacturing products for use in some of the world’s most demanding environments. Our lines of actuators, fire-safe ventilation valves and flux drive couplings are built in the US to exacting standards to withstand the test of time. Compliant with strict navy shock and vibration, fire, noise, EMI, and other life cycle requirements, Tri-Tec is a leader in developing products helping to keep our customers and our Navy #1 in the world!